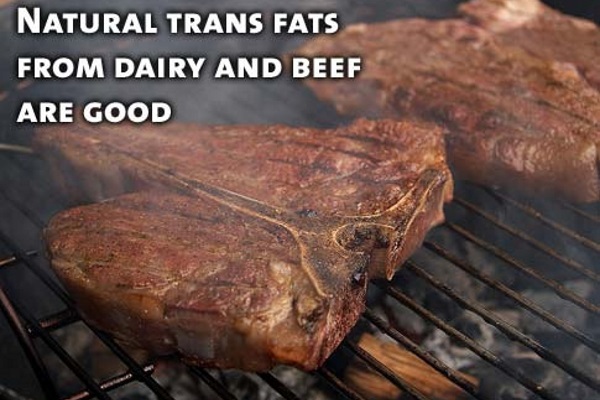 New evidence suggests that low levels of trans fatty acids (TFAs) may not be as harmful to human health as previously thought, even if industrially produced, and may even be beneficial if they occur naturally in foods such as dairy and meat products, according to a study published in the European Heart Journal. Artificial TFAs occur when oil goes through a process of hydrogenation, which makes the oil more solid. They are used as ingredients in processed foods, such as cakes, biscuits and pies, and for frying. It has been well-established that high levels of industrially produced TFAs in food can lead to high cholesterol, heart problems, strokes and diabetes, and they have even been linked to infertility, Alzheimer’s disease and some cancers. Action has been taken in the USA to reduce the amount of artificially produced TFAs in food, while intake of these has tended to be lower in most of Europe. However, until now it has been unclear what is the highest concentration of TFAs that is safe for humans, and whether or not there is any difference between industrially produced TFAs and naturally occurring ones. Researchers in Germany, led by Dr Marcus Kleber, a post-doctoral researcher at the Vth Department of Medicine of the Medical Faculty Mannheim at Heidelberg University, measured the concentrations of TFAs found in the membranes of red blood cells in participants in the Ludwigshafen Risk and Cardiovascular Health (LURIC) study. A total of 3316 people living in south-western Germany joined the study between 1997 and 2000 after being hospitalised in order to have coronary angiographies to investigate heart disease, and 3,259 of them were analysed for this study. During a median follow-up period of just over 10 years (ranging from less than one year to nearly 12 years), 975 (30%) of these patients died. The researchers analysed blood samples from the patients to identify the total concentrations of TFAs, as well as distinguishing between the concentrations of industrially produced and naturally occurring TFAs. They linked this with information on deaths, causes of death, medical history, and other factors that could affect results, such as whether or not the patient were taking cholesterol-lowering drugs, such as statins, and risk factors such as smoking, lack of physical exercise, body mass index (BMI), diabetes and high blood pressure. Dr Kleber said: “We found that higher concentrations of TFAs in the membranes of red blood cells were associated with higher LDL or ‘bad’ cholesterol, but also with lower BMI, lower fats in the blood (triglycerides) and less insulin resistance and, therefore, a lower risk of diabetes. We were surprised to find that naturally occurring TFAs were associated with a lower rate of deaths from any cause, and this was driven mainly by a lower risk of sudden cardiac death. The proportion of TFAs in the blood of the study participants ranged from 0.27-2.40% of total fatty acids, with an average of just under one percent. Another study in the USA over a similar time period reported an average of more than 2.6% of total fatty acids. The patients were divided into three groups: those that had the highest concentrations of naturally occurring TFAs (greater than 0.2%) had a 37% reduced risk of sudden cardiac death as compared to those with the lowest concentration, after adjusting for various factors that could affect the results. Results for any other associations between total TFAs, industrially produced TFAs or naturally occurring TFAs and death were mostly not statistically significant after adjustments for confounding factors. Dr Kleber said: “Our results show that the low levels of industrially produced TFA we found in the LURIC study did not pose a health risk, and therefore could be regarded as safe. We also found that trans-palmitoleic acid (a naturally occurring TFA found in milk and meat from ruminant animals) is associated with better blood glucose levels and fewer deaths from any cause, but especially a lower risk of sudden cardiac death. The above post is reprinted from materials provided by European Society of Cardiology. Note: Materials may be edited for content and length.